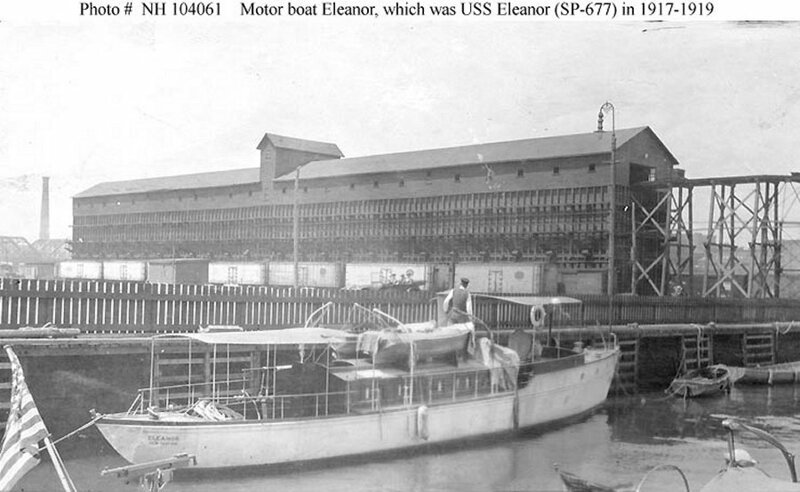 Motorboat: Built in 1910 as Tringa by Murray and Tregurtha, South Boston, MA; Renamed Eleanor; Acquired by the Navy in June 1917; Commissioned USS Eleanor (SP 677), 9 July 1917; Decommissioned 12 December 1918; Returned to her owner, C. B. Houghton of Corning, NY 14 April 1919. Fate unknown. Specifications: Displacement unknown; Length 58'; Beam 11' 9"; Draft 4' 6"; Speed 10 kts. ; Complement nine; Armament one 1-pounder. 99k In port, probably when she was delivered to the Navy in June 1917 for use as a patrol craft. Her name and home port (New Bedford, Massachusetts) are visible on her stern. A Colt machine gun is in the left foreground, mounted on another boat.